With the outstanding gardens and the views of the Cypriot countryside, Villa Akamas Bayview makes a great addition to our Very Villa Plus programme. This delightful villa is just a short drive from Latchi Beach, town and it's charming harbour - this is the perfect place for the real seafood fans! 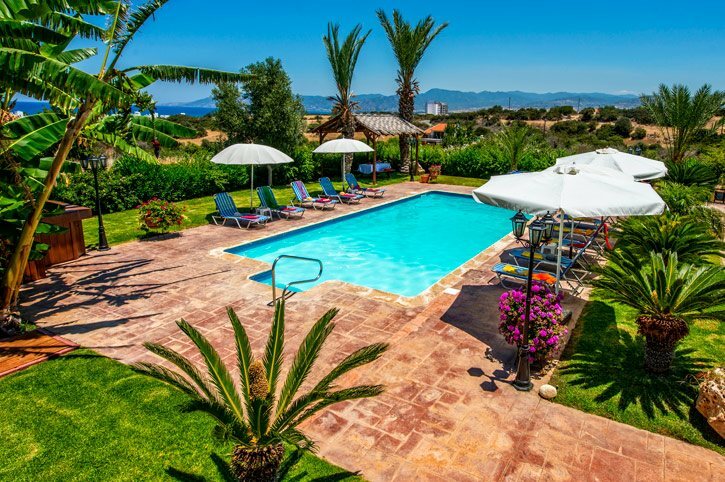 The villa is spacious inside and out and has a large pool - great for a relaxing holiday! WiFi, pool heating and air conditioning/heating in all 5 bedrooms are included. Immaculate gardens, views of the Cypriot countryside and sea in a distance plus, Latchi harbour is a short drive away - the best of both worlds! The outside area at Villa Akamas Bayview is simply amazing! There is a large lawned area with several palms and shrubs forming an exotic garden - your perfect oasis to relax. To the far side of the pool is a large pergola for extra shade and picnic style tables. The large swimming pool is great for chilling out on a hot day. On the covered terrace there is a large table and chairs - very convenient for dining alfresco on those balmy Cypriot nights. Four steps lead up to a covered porch and the villa entrance. There is the covered double parking area for your hire car, which can be accessed through steps inside the villa. Next to the spacious airy hall, down 2 steps is a large lounge split by a feature fireplace creating 2 seating areas, which both consist of comfortable sofas and one of them has a flat screen TV. The patio doors take you to the outside dining area. Next to the lounge is another bright area where the dining table and chairs are located. Next to this area is the well-equipped kitchen with all the modern appliances and a door leading out to the BBQ, plus another dining area. There is a separate utility room. There are 5 bedrooms in total in this villa. A few steps lead to an upper ground floor hallway where 4 bedrooms are located. The 3 twin bedrooms each have en suite shower room and access to a private balcony. The double bedroom has a walk in wardrobe and en suite bathroom as well as access to the private balcony with the views overlooking the pool and out to the Mediterranean Sea. There is a separate bathroom. The remaining twin bedroom is next to the living area. There is a separate WC. Villa Akamas Bayview is ideally located in a beautiful countryside setting amongst citrus and olive groves. The centre of Latchi, the beach and harbour are all just a short drive away. The authentic village of Polis with its shops, restaurants and beach is a little bit further away. The lively Coral Bay is less than an hours' drive and is perfect if you want to spend a day on a sandy blue flag beach this resort has to offer. The villa setting is perfect for days out and discovering all those beautiful places in Cyprus! The villa is located a short drive from several mini markets in Latchi. Paphos Old Town is just over an hours' drive away, and with its narrow streets and covered market, is worth a visit . The traditional shops where you can buy lace, local trinkets and little keepsakes of your stay in Cyprus are great for authentic souvenirs reminding you of your holiday. Latchi is famous for its quality fresh fish and seafood restaurants. At the end of the beach is the beautiful harbour where the old stone carob warehouses have been converted into restaurants. Here you can sit and watch the old fishing boats in the harbour while enjoying your meal. A few miles east of Latchi, you will find the town of Polis, which has a pedestrianized village centre, where there are a handful of traditional tavernas and restaurants. This delightful 5 bedroom countryside villa is just a short drive from Latchi Beach. Driving further east you will find the beach at Polis while heading south you will find the popular beach at Coral Bay. In Polis, there is go-karting to try and parks where you can enjoy a picnic. Paphos Zoo is great for a day out. One of the 4 most popular water parks on the island is the Aphrodite Waterpark in Paphos, which has an area and rides for smaller children such as slides, fountains, water guns, and even a slippery octopus to climb! For the bigger children or brave and adventurous adults there are whirlpools, kamikaze slides and wave pools. Latchi Village is situated in the foothills of the Akamas National Park on the North West Coast of Cyprus. You can hire boats from the harbour and explore the coastline of the Akamas, which is steeped in history and famous for its white sandy beach coves, and the Blue Lagoon. Along the coastline, which takes you to the Akamas Peninsular, lies the Bath of Aphrodite where allegedly the goddess used to bathe. The park itself is famous for its 500 plant species and wide variety of birds, mammals and butterflies. Also situated on the Akamas Peninsular is Lara Bay, an important nesting ground for endangered turtles. There are several golf courses in the Paphos area. The Mario's Golf has a driving range, crazy golf and even foot golf. Alternatively, if you're looking for a 'real' round of golf, Tsada golf club would be another choice. A further 2 courses are in the Larnaca district of the island. Neo Chorio is a tiny, very traditional Cypriot village, which is close by to Latchi. Sitting right on the tip of the coast, Neo Chorio has stunning views and is the ideal place to get away from it all. Villa Akamas Bayview is not available to book for season as it is sold out. Take a look here at the Cyprus villas that are currently on sale. Lovely villa, beautiful, well-kept gardens and pool. Great location for views and easy access to Latchi by car. Absolutley gorgeous villa in a brilliant location with spectacular views of the Bay.